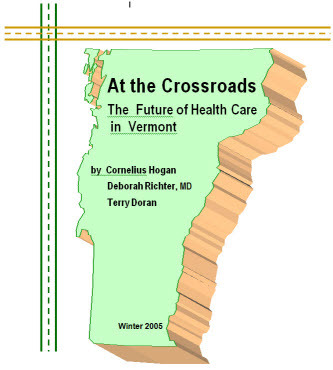 At the Crossroads: The Future of Health Care in Vermont is the first comprehensive book about health care that focuses on Vermont. It uses data and extensive citation to build a case for badly needed change. It was responsible for extensive legislative debate and action in the ensuing year after its publication. The book is currently being updated to ensure that the data is current in the rapidly changing cost side of health care. "The best thing about this book is that it shows the way to make the compromises necessary for reform and the rationale for them." "This book is a 'must read' for all persons in Vermont involved in shaping and implementing a future health care system." "The autors make a powerful and persuasive case that significant change is needed now in the delivery and financing of health care in Vermont." At the Crossroads is out of print for purchase. It is now available as a PDF download.